Late summer and fall are perfect times to collect and save seeds from your flower and vegetable gardens. Collecting seeds is a good way to replant the same variety next year and save some money. While most seeds can be saved for one year and germinate and grow well, some vegetables and flowers, if stored properly, can last many years and still grow. Here are a few tips to keep in mind when collecting and saving seeds. Hybrid varieties of vegetables and flowers don’t produce seeds that will be true to the parents next year. Collect heirloom or open pollinated seeds only, unless you want to experiment with what grows from your hybrids next spring. When starting out, collect seeds from plants such as peas, beans, dill, calendula, poppies and marigolds. 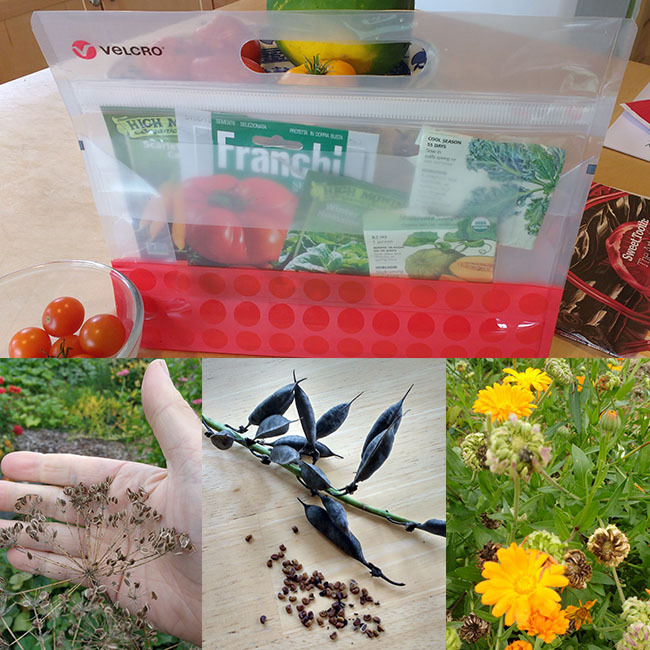 These are easy seeds to collect, dry and save. Don’t collect seeds from disease or insect ridden plants. Collect from healthy flowers or vegetables. Collect the seeds when the flower or seed pod is mature, but before it starts dropping the seeds on the ground. It’s best to collect small seeds, such as poppies and dill, in a paper bag. Remove chaff and other plant debris from your collected seeds. Make sure seeds are dry before storing. Place the seeds in a well-ventilated, dry, warm room for a few weeks until dry. Proper storage is important to get them to survive the winter and germinate well in spring. Seeds should be stored in a dark, cool, dry room. Place them in a sealed container such as the VELCRO® Brand PRESS-LOK® Bags. It’s also a good idea to place partly used, opened seed packets in these containers too, to help preserve these seeds for next year.